Howdy folks! It’s not too late to enter the giveaway for the $50 gift card from Sur la Table! Last week was a chilly week, so I made a pot of chili. Hee hee… get it? 😀 Incidentally, this was also the chili I was going to make for our Super Bowl shindig that never happened (*grumble* damn Chris’ flu!). If you are not a fan of chili (I know —shocking isn’t it, but who doesn’t like chili? Kimi and Nelson, that’s who! ), this chili will change your mind. You can omit the beans or go easy on the jalapeno pepper but whatever you do, the corn is a must! It gives it such great texture and color! 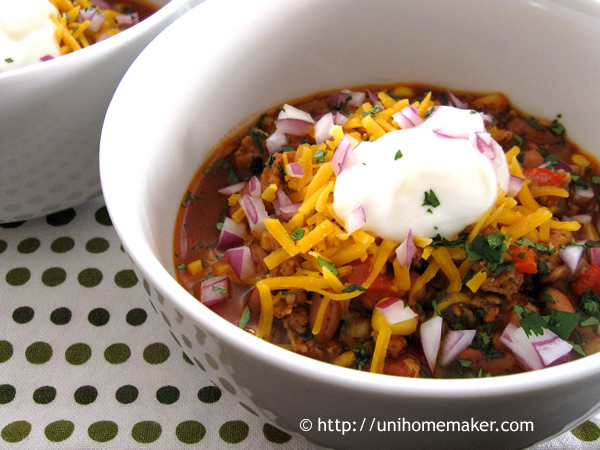 So the next time you are in the mood for a pot of chili, give this recipe a try.